Warning: the use of current mode CTs with the NetMeter can damage it. An appropriate burden resistor MUST be used with these CTs in order to be able to use them with the NetMeter. Damage to the NetMeter caused by the use of current mode CTs is not covered under warrantee. If a CT is rated as a current ratio, then it does NOT contain a burden resistor. A common CT type is 5A CTs that produce 5A at the rated primary current. 5A CTs can be very dangerous to work with when primary current is applied. If existing 5A CTs are already in-circuit, it is easy to place a 5A to 0.333V CT onto the secondary of the original 5A CT. This is the safest way to attach. Due to the fact that the R value is so low, wire resistance can be a factor. Consequently, the voltage leads should be placed very close to the resistor body. 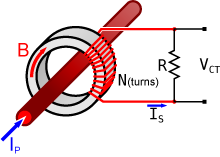 A CT encloses a primary current (Ip) and produces a secondary current (Is) through the secondary winding of N turns (the turns ratio).